MSU Engineering Dean Leo Kempel and NTUA Rector Prof. John Golias celebrate the dual PhD agreement between the two academic institutions. Officiating (seated, left to right) at the ceremony were MSU Engineering Dean Leo Kempel and NTUA Rector Prof. John Golias, and (standing) Prof. Elias Glytsis - Outgoing Associate Chair for Graduate Studies, ECE NTUA; Prof. Marinos Kavouras - Incoming NTUA Vice-Rector for Academic Affairs and Administration; MSU ECE Department Chair and Professor John Papapolymerou; Prof. Nectarios Koziris, Dean of the School of ECE NTUA; Prof. Dimitris Papantonis, Outgoing NTUA Vice-Rector for Academic Affairs and Administration; and Prof. Dimitris Soudris, Incoming Associate Chair for Graduate Studies, ECE NTUA. 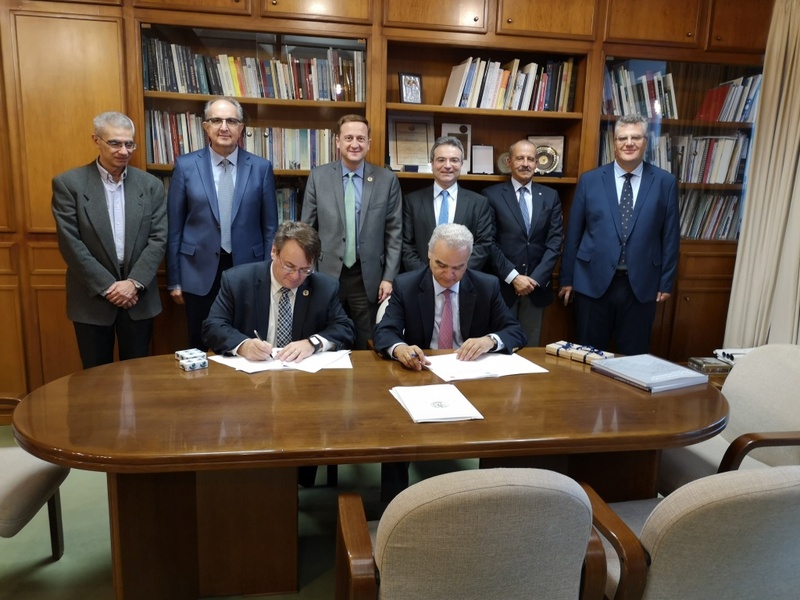 With the agreement, begins the co-operation of the School of Electrical and Computer Engineering of NTUA with MSU. The Dual PhD Agreement was signed by Prof. Ioannis (John) Golias, Rector of the National Technical University of Athens, Prof. Leo Kempel, Dean of the MSU College of Engineering, Professor Nectarios Koziris, Dean of the School of Electrical and Computer Engineering, NTUA and John Papapolymerou, MSU Foundation Professor, who chairs the Department of Electrical and Computer Engineering (ECE). Prof. Golias stated: "By signing this agreement with MSU we enhance cooperation with top Engineering Schools and broaden the horizons of global communication among professionals across the continents. Only positive impacts can arise for the two institutions concerning both the academic personnel and of course the graduates". Prof. Kempel said participating PhD students will graduate with dual doctoral degrees, one from MSU and one from NTUA. “Innovative dual degree programs, like this one with NTUA, allow students to build global networks through research experiences at partner institutions”, he added. “The outreach opportunity for current faculty members to connect with fellow academics and industry partners in each country is tremendous. It builds the kind of technology and cultural bridges that MSU is famous for around the world» said Prof. Papapolymerou. Students will enroll in an NTUA doctoral engineering program while enrolled in a doctoral engineering program at MSU. Faculty members from both institutions will serve as advisors on each student’s committee. Only one thesis will be required. The students will receive a PhD from both Michigan State and NTUA when they graduate. Students in the dual-enrollment program will have access to some of the best science and technology resources and facilities in the two countries. PhD students will begin at MSU in the 2019—2020 academic year.